The 70-685 Real Practice-Lab will provide you the necessary platform to gain hands on skills in Windows 7 desktop. By completing the lab tasks you will improve your practical skills in desktop application issues, mobile users and security issues. Becoming proficient in these tasks will also help you understand the objectives and competencies required by the Pro: Windows 7, Enterprise Desktop Support Technician certification exam. Desktop Application Issues: One of the biggest challenges faced by desktop technicians when deploying new applications to their desktop estate is trying to identify installation or compatibility issues. Using your Real Practice-Lab you have the ability to learn and test the tools to assist you in this area. Having the ability to "start over" really quickly and easily makes getting to grips with these tools much easier. 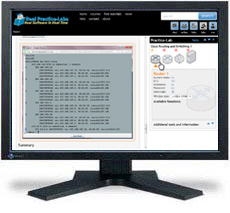 In the lab you will be able to identify and resolve new software installation, configuration and failure issues. Networking Issues: As a desktop technician supporting any number of users you are faced with logon issues, network connectivity issues, names resolution issues and network printer issues on a daily basis. Knowing how to pin point the root cause of the problem quickly and effectively reduces downtime and improves SLA's. Using your Real Practice-Lab you can learn the tools at your disposal to help you resovle these problems in the shortest amount of time possible. Managing and Maintaining Windows 7 Clients: Another challenge is dealing with internal or mobile users who say "my computer is slow" or "my screen is flickering" to name a few. Knowing what tools are available to you in order to identify the potential issue is of great benefit to you and your users. Use your Real Practice-Lab to develop your skills in identifying/resolving performance issues and hardware failure issues. Security Issues: With the internet being full of malicious software and exploits it is up to support staff to combat these and ensure the computer security of the organisation is up to scratch. Configuring the incorrect settings can be dangerous to your internal environment so test these in your Real Practice-Lab to make sure they are fit for purpose. These may include Windows Internet Explorer security issues, encryption issues or software update issues.